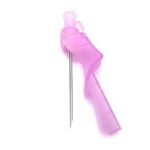 18 gauge, sterile Monoject Admix needle measuring 1.5" without safety. 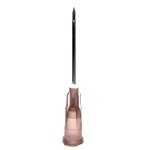 Stainless steel needle is regular wall with anti-coring point and 5 micron filter. Manufactured by Covidien. Comes in a box of 100. 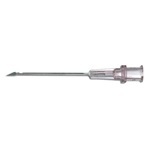 18 gauge, sterile PrecisionGlide hypodermic needle measuring 1" without safety. Stainless steel needle is regular wall with beveled point. Pink polypropylene hub with standard luer connection. Manufactured by BD. Comes in a box of 100. 18 gauge, sterile hypodermic needle measuring 1" without safety. Stainless steel needle is regular wall with beveled point. Pink polypropylene hub with standard luer connection. Manufactured by Exel. Comes in a box of 100. 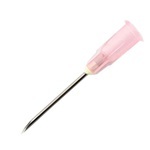 18 gauge, sterile hypodermic needle measuring 1" without safety. Stainless steel needle is thin wall with beveled point. Pink plastic hub with luer lock connection. Manufactured by McKesson. Comes in a box of 100. 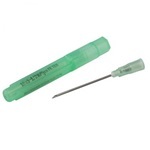 18 gauge, sterile PrecisionGlide hypodermic needle measuring 1.5" without safety. Stainless steel needle is regular wall with beveled point. Pink polypropylene hub with standard luer connection. Manufactured by BD. Comes in a box of 100. **THIS ITEM IS CURRENTLY ON BACKORDER. ** 18 gauge, sterile PrecisionGlide hypodermic needle measuring 1.5" without safety. 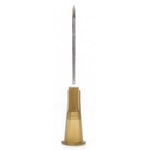 Stainless steel needle with regular wall and bevel point. Polypropylene hub is pink. Manufactured by Exel. Comes in a box of 100. **THIS ITEM IS CURRENTLY ON BACKORDER. ** 18 gauge, sterile hypodermic needle measuring 1.5" without safety. Stainless steel needle is thin wall with beveled point. Pink plastic hub has luer lock connection. Manufactured by McKesson. Comes in a box of 100. 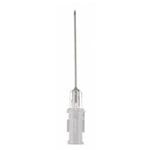 18 gauge, sterile Nokor medication transfer needle measuring 1.5" without safety. Stainless steel needle is thin wall with beveled point and 5 micron filter. Manufactured by BD. Comes in a box of 100. 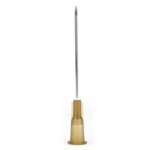 18 gauge, sterile Eclipse hypodermic safety needle measuring 1.5" with hinged shield. Needle is regular wall and bevel. Pink polypropylene hub with luer locking connection. Manufactured by BD. Comes in a box of 100. 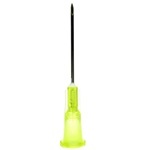 18 gauge, sterile SafetyGlide hypodermic safety needle measuring 1.5" with activation-assist needle shield. 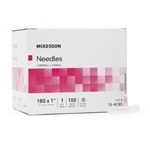 Needle is regular wall and bevel. Pink polypropylene hub with standard luer connection. Manufactured by BD. Comes in a box of 50. 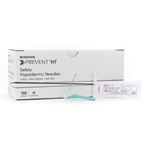 19 gauge, sterile PrecisionGlide hypodermic needle measuring 1" without safety. Stainless steel needle is thin wall with beveled point. Brown polypropylene hub with standard luer connection. Manufactured by BD. Comes in a box of 100. 19 gauge, sterile ExelInt hypodermic needle measuring 1.5" without safety. Stainless steel needle is regular wall with beveled point. Brown polypropylene hub with standard luer connection. Manufactured by Exel. Comes in a box of 100. 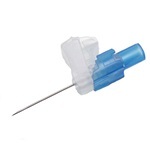 19 gauge, sterile PrecisionGlide hypodermic needle measuring 1.5" without safety. 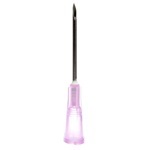 Stainless steel needle is thin wall with short beveled point. Brown polypropylene hub with standard luer connection. Manufactured by BD. Comes in a box of 100. 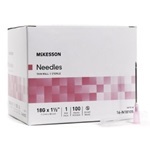 19 gauge, sterile Nokor medication transfer needle measuring 1.5" without safety. Stainless steel needle is thin wall with beveled point and 5 micron filter. Manufactured by BD. Comes in a box of 100. 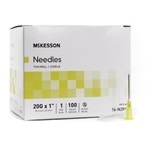 20 gauge, sterile Monoject Admix needle measuring 1.5" without safety. Stainless steel needle is regular wall with anti-coring point and 5 micron filter. Polypropylene hub is green. Manufactured by Covidien. Comes in a box of 100. 20 gauge, sterile hypodermic needle measuring 1" without safety. Stainless steel needle is thin wall with beveled point. Yellow plastic hub with luer locking connection. Manufactured by McKesson. Comes in a box of 100. 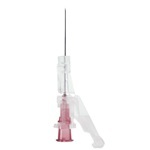 20 gauge, sterile PrecisionGlide hypodermic needle measuring 1" without safety. Stainless steel needle is regular wall with beveled point. Brown polypropylene hub with standard luer connection. Manufactured by BD. Comes in a box of 100.